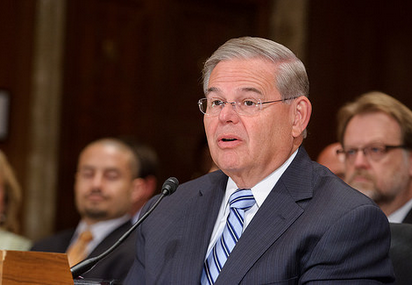 Senator Menendez testified on behalf of NJ residents receiving egregious Insurance Bills..
“While homeowners across the country are already seeing relief, for some, that relief has not yet come. Unfortunately, I’m still hearing stories of egregious and unreasonable rate hikes in New Jersey. Take the case of one of my constituents, Claudette, from Highlands, New Jersey. Before Sandy destroyed her house, she had been paying around $2,500 a year in premiums. When she began rebuilding, she followed all the rules–built not just up to code, but above and beyond the required standards…But, despite doing the right thing–following all the rules–her premium skyrocketed from $2,500 to $34,000. Think about that for a minute… $34,000 a year for flood insurance… Almost $350,000 over ten years. This simply does not pass the smell test. Fortunately, my office worked with FEMA to reduce Claudette’s premium to $7,700, but it is still far too high…And I will continue to work to see that Claudette gets the relief she deserves. I also heard from Rick from Union Beach, New Jersey –who saw his rates increase 50-fold from $550 to $30,000.Rick’s case is similar to Claudette’s. He too rebuilt his house above the required standards–3 feet above, in fact, but is still being charged prohibitively expensive premiums based on the old, inaccurate maps. There are 540 counties out of 3144 counties nationwide that will be affected by the Biggert Waters Act. Thank you for posting this. Senator Menendez and his staff has truly gone to bat for me in this battle that is going to begin impacting everyone in our town. I have been able to connect another resident in Highlands with the staff and they are working diligently to assist this resident. I am disappointed that our local state Senator Beck or Congressman Pallone has not been involved in what we are all going to be facing. I am not sure why either deems the constituents in their districts don’t deserve their help in these vital matters but I am more than willing to discuss this with either one should either wish to contact me. Pallone has been useless to Highlands since Sandy but you can be sure he will be in town for his photo op at clamfest. Thanks Claudette for being a major player in bringing this whole FEMA and NFIP insurance rate fiasco into the limelight. This goes beyond local and I’m surprised that other NJ elected officials, and the Governor, and all the states impacted by flood disasters for that matter, are not protecting the interests of their constituents. Now …. if you can condense it down to 2 minutes you might be able to get our Council to lobby the Monmouth County Freeholders for some added support? I see photos of Mayor with Lt Governor and members of council with Mr Pallone but no lobbying or fighting for Highlands interests. Weak… We need strong leadership with guts to stand up and fight for us instead of fighting against us! What everyone in lower Highlands who has lifted on “solid” foundations needs to realize is that even if their insurance was “renewed” at the lower premium if they are in the V zone going to an AE they are going to be back billed for the higher premium once FEMA catches up to them. If you were 50 % damaged OR if you knocked down and rebuilt if you are not on “open” pilings you WILL be affected. Ignoring the issue or thinking you are “exempt” just because you were renewed at a lower premium will NOT make this go away. If you did not submit your new flood elevation certificate showing you are currently a V going to an AE you are considered as committing fraud and can be prosecuted for that also. Avoidance of the issue or claiming ignorance will not exempt you from the law. The Biggert Waters Act that was reinstated allows FEMA and NFIP until July 2015 to sign the AE map for us and everyone who is in the V that repaired will eventually get caught. Still not sure why Senator Beck or Congressman Pallone have not brought this forward because it affects a lot of people in their districts that have mortgages OR are taking REM money to repair. People need to wake up and face the facts, scary as it is. Claudette – I wanted to confirm that the other gentleman from UB was insured with Wright insurance company. I think its important to note that this is NOT just a NJM flood insurance issue. Yes that’s correct . According to Erin the reporter from Star Ledger the Union Beach couple had Wright as their insurer. I also spoke with Russ Zimmer from Gannett press and he is also getting feedback from others who are beginning to hear from their insurers. I did email twice to Senator Beck and Congressman Pallone as well as Governor Christies office and never received any responses. Meg Baker from Chasing New Jersey, Russ Zimmer from Gannett Press and of course Senator Menendez have been far more receptive and helpful. Just still a little shocking that after the Asbury park press article titled ” Highlands Couple…” that I did not hear from Senator Beck. Perhaps she has more important things to do than worry about the constituents in her town and the problems they are facing.